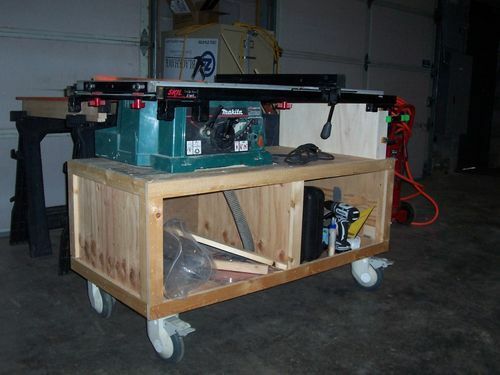 I want to make a rollling cart for the saw and extend the side tables and have a flip up outfeed table as well. The thing that is stopping me is finding a solution to extend the rip fence. At the moment I can rip about 18.5” and I would love to get it to about 30” Has anyone had success extending the fence rail system? Or, has anyone come up with another fence solution? Any help is greatly appreciated. I primarily use my 745 on the job site, not in my shop. I use a rousseau stand that extends the rip capacity with a t style fence to 27” but can go further with extension tables. With the out feed table it really extends the functionality of the dw745 and other small job site saws quite a bit. Here is a shot of it set up in my shop when not in use on a job site. The only solution would be doing what the Rousseau system does – abandon the DeWalt fence and go with an aftermarket fence. 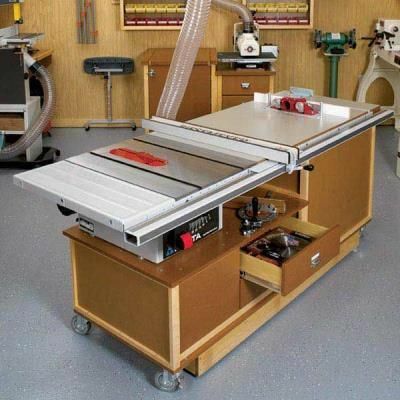 I would get that system myself, but by the time you add up the dollars you could get a great used cabinet saw. A cabinet saw isn’t an option on a job site. The Rousseau system is a bit on the steep side but worth every penny imho. if your a carpenter that doesn’t work from a shop I haven’t found a better fold up portable solution that I can throw in the back of my truck. 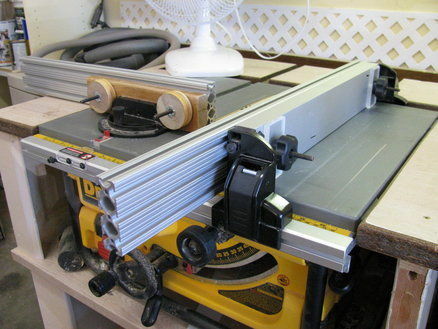 (I do have a much beefier table saw in my shop that doesn’t move ). probably closer to what he needs. One would just need to mount the fixed guide rails of something like a Beisemeyer fence to the cabinet. 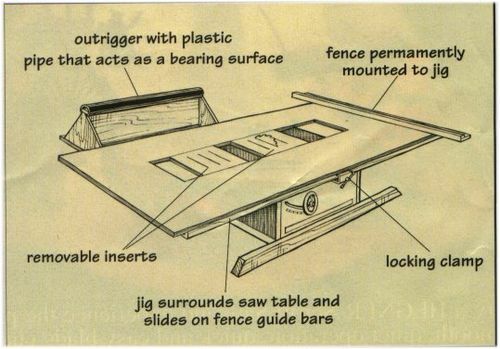 Is there a way to encase it in a piece of bigger plywood (whatever size you can have over there) and make your own fence? Theoretically all you would need was a straight board or whatever clamped at 90 degrees. 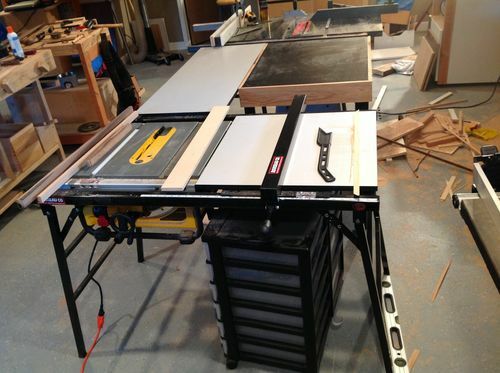 Mathias Wandel at woodgears made his own table saw with a circular saw. But his fence system might be something to think about. I don’t know why you feel the need to extend the fence, inasmuch as the piece being ripped only needs the fence where the blade is. If your concern is the possibility of drift beyond the fence, two thoughts: 1) Install a splitter in the outfeed table, aligned with the blade, being sure to sharpen the edge that points toward you to keep the workpiece from running into it, or; B) Just make sure to keep the piece from drifting by maintaining tension against the fence. Or, take a piece of plywood, rip the width to the height of the fence and the length you desire, drill two holes in one edge, and concoct a way to clamp the long fence to the fence fence. There are fence-clamping clamps made for the purpose, but you could probably fashion such a thing yourownbadself. Thanks everyone for the help. Paul, your solution seemed perfect until I tried to find the table here in Germany. So far no luck. I’ll try to contact the company and hope for the best,,,, the option of the after market fence might be the best option for me. I don’t have the space for an European cabinet saw and even if I did its out of my price range for now. Thanks as well for the various cart options. One of them look very similar to what I had in mind. 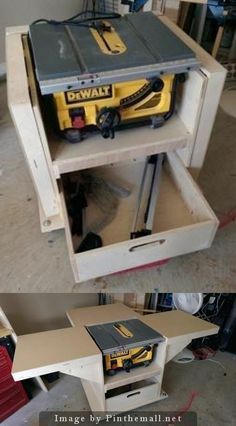 I have the dewalt saw and mine is the cheapest one and I can still flip the fence out to the end and cut 24” ply easily. has anybody used this system? Here's what I use and how to do it.